Welcome to the May 2010 Actrix Online Informer. The year is really ticking along. I was always told that the older you get the faster time goes by and that seems unfortunately true. This month we've seen more of those emails that claim to come from your ISP warning that your email account will be shut down if you don't go and log in somewhere. These are, of course, phishing attempts designed to dupe you out of your personal information. One was particularly sophisticated, well-formatted and even bore our logo. Usually our spam filters catch these, but the odd one can slip through. Please rest assured no respectable ISP will delete your email account, even if it is apparently unused, and any email you didn't ask for that has a link to a log in should be treated with suspicion. We've recently been getting more calls to support about setting up mobile phones for Actrix email. We're not able to support each and every mobile phone email application, but luckily the settings required for checking your Actrix email on your mobile phone are entered in roughly the same place and same way with most phones. The form may also ask for an Outgoing mail server. The general rule of thumb is that you will only be allowed to send email using the outgoing mail server of the mobile network you are connecting through. If you're on a Vodafone connection, you will have to use Vodafone's outgoing mail server, for example. This is an anti-spam measure. Spammers would love to use outgoing mail servers from other ISPs because it makes them hard to trace. Outgoing mail servers are therefore usually set up only to allow connections from their own customers so the customer can be traced and identified if they misbehave. This can cause a bit of hassle. A lot of the newer phones can connect to wireless broadband networks (where available), and it can become quite a nuisance having to change the outgoing mail server settings each time you start using a different connection. If your phone supports it, the best way around this is to set up what is called "Secure SMTP" which will let you to send using the Actrix outgoing mail server no matter which Internet provider or network you are connecting through. It requires your user name and password, so you can be traced and identified if you misbehave. Once all of these settings are in place, you should be ready to send and receive emails with your mobile phone. If your mobile phone does not support Secure SMTP, or if you are unable to find it anywhere in your phone's email application, you will have to use the outgoing mail server of the mobile network or Internet provider you are connected with. For those connecting with Actrix, this would be smtp.actrix.co.nz; if you are connecting with another provider, such as one of the mobile network providers, you will need to use their outgoing mail server. You will probably be able to find the name of their outgoing mail server on their website, or you could call their help desk. We've just upgraded our range of CyberJet broadband plans to provide faster speeds at lower prices! Plans start from Full Speed down / 128Kb up with a 3GB monthly traffic allowance for $29.95 when bundled with Actrix Tolls (or $39.95 without); for the full range of plans just click here. Of course! We offer a Free Connection Only installation with a 12 month contract (an additional wiring charge may apply but in most cases isn't required), you'll also need a broadband modem which we can provide preconfigured and ready to go. Take a look at Setup is Simple for more information. To make the move to Actrix broadband just click here to select a plan and sign up online, or give us a call and we can talk you through the process. Can I transfer my existing broadband? Definitely, and right now you can transfer an existing broadband connection for free with no strings or contract period at all! If you have any questions please feel free to E-mail info@actrix.co.nz or call 0800 ACTRIX (228-749) between 8am and 11pm seven days. You�re constantly told how easy it would be to hack your weak passwords (see Interesting sites, below), but complicated passwords just aren�t something our brains get excited about memorising. Here is a brilliant tip that turns weak passwords into something much, much better. Stick with your weak, dictionary password if you must; just move your fingers over a space on the keyboard. Something longer but still really lame, like, say, �topsecretpassword�, becomes �yp[drvtry[sddeptf�. These may not be perfect compared to secure password generators, but they�re likely orders of magnitude better than a lot of people�s go-to passwords. Adapted from Lifehack.com, 14 April 2010. The Webby Awards are an annual event held since 1996 honouring excellence on the Internet. Altogether awards are given in more than 100 categories. Two honours are given in every category – The Webby Award and The People's Voice Award. Members of The International Academy of Digital Arts and Sciences select the nominees for both awards in each category, as well as the winners of the Webby Awards, but the worldwide online community determines the winners of The People's Voice awards by popular vote. At the Webbys website you can peruse a list of current nominees as well as lists of the winners from past years. It's a great way to enjoy some really top quality websites, and the list of categories is so diverse that there really is something for everyone. Categories, for example, range from best visual design (aesthetic) which will appeal to arty types, to humour, business, politics, culture and so on. Each past winner or current nominee is linked to, making for a very sizable list of diverse and interesting stuff. You can check out the list of current nominees at www.webbyawards.com/webbys/current.php?season=14. Along the top there are links to pages for previous years' winners where there's likely to be even more interesting stuff. The Webbys are famous for limiting recipients to five-word speeches, which are often humorous. In 2005 when accepting his Lifetime Achievement Award, former Vice President Al Gore's speech was "Please don't recount this vote." He was introduced by Internet founder Vint Cerf who used the same format to state, "We all invented the Internet," playing on Al Gore's infamous, if probably misquoted, claim to have invented the Internet himself. This year's Webbys will be given out in June. Malcolm writes: I was changing the font in Outlook Express and when I returned to my inbox one e-mail was in red and the message I got was : "This email is being watched." Does this mean anything? Hi Malcolm, "Watch" is a function of Outlook Express which allows you to keep track of related emails, that is all the replies a certain email you are interested in has received (called a �conversation�). If you mark an email as "watched" it will have a little symbol next to it, and be in a different colour in your inbox to help you find it. So will replies and forwards that come back to you. It's a great way to keep track of something if you have a full or busy inbox. To turn "Watch" on or off select the email whose conversation you wish to watch or unwatch, and on the Message menu, click "Watch Conversation". You can customise the colour of your watched messages to make them stand out better. Click the Tools menu, and then click Options. On the Read tab, at the end of the Highlight watched messages with the colour line, select the colour you want, and then click OK.
http://www.fiverr.com/ – So how this works is you submit a gig for a small service you are willing to offer for a $5.00 fee. If someone accepts your offer, you get $4.00 credited to your PayPal account as soon as you deliver the service. All sorts of services are offered, but the most entertaining are found in the "Fun and Bizarre" and "Silly Stuff" sections. http://www.us.mensa.org/AM/Template.cfm?Section=Top_50&Template=/customsource/top50_winners.cfm – Many of these sites have appeared in Actrix Online Informer Interesting sites sections in the past. A few have been left out because they're so oriented towards Americans. Be that as it may, a collection of 50 sites selected by really smart people can only be a good thing. The sites are divided up into the following categories: Art and Culture, Entertainment and Humour, News and Politics, Reference, Science and Technology, Search Engines. Shopping, and Social Networking/Media. http://www.lifehacker.com.au/2010/03/how-i%E2%80%99d-hack-your-weak-passwords/ – Some people might be surprised at how easy it is to crack some passwords. This Lifehacker article gives a great insight into how password hackers work, and just what makes for good and bad passwords. "Internet standards expert, CEO of web company iFusion Labs, and blogger John Pozadzides knows a thing or two about password security – and he knows exactly how he'd hack the weak passwords you use all over the internet." 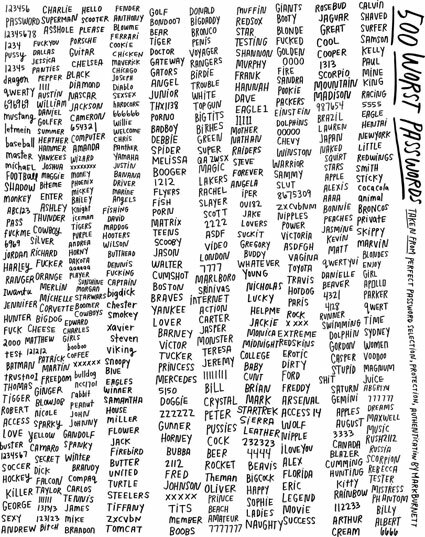 Here's a list of the 500 worst passwords at another site. www.wikileaks.com/ � Wikipedia says "Wikileaks is a Sweden-based organisation that publishes anonymous submissions and leaks of sensitive documents from governments and other organisations, while preserving the anonymity of its sources. Wikileaks states that its primary interest is in exposing oppressive regimes in Asia, the former Soviet bloc, Sub-Saharan Africa and the Middle East, but we also expect to be of assistance to people of all regions who wish to reveal unethical behaviour in their governments and corporations." http://unrelatedcaptions.com/ – Unrelated captions is a bizarre addition to the internet. Oddly enough, images whose captions have nothing to do with them can be absolutely hilarious – often much funnier than if their captions were relevant, or so the theory goes. http://whanauconnect.co.nz – Maoridom's answer to Facebook is now live online. The Te Puni Kokiri-backed social-networking platform has been put together by manager Kataraina Hetet and program developer Tanya Wilson. Ms Hetet says the website designers have produced a tool that will enable all Māori to connect to their marae and support each other in a private and secure environment. www.gimme.co.nz/ – Gimme is "New Zealand's ultimate guide to free stuff. Competitions and giveaways are a fantastic way for companies to increase product awareness and sampling. Gimme makes it easy to run promotions and generate tonnes of interest," according to the New Zealand Herald. Read the article here. http://movies.yahoo.com/feature/100-movies-to-see-before-you-die-modern-classics.html – "It's easy for classic movie lovers to be nostalgic for Hollywood's "Golden Age" of the 1930s and '40s. And many cineastes will tell you that film as an art reached its peak in the late '60s and early '70s. But the truth is there have been remarkable movies made in the 1990s and 2000s. From big budget blockbusters, to breakout independent films, to discoveries from around the world, we have seen exciting and groundbreaking cinematic work created in the last two decades." www.boston.com/bigpicture/2010/04/more_from_eyjafjallajokull.html � Here is a collection of 35 stunningly beautiful photos of something terrifyingly powerful, courtesy of the Boston Globe. The photos are reasonably high-resolution so may take some time to load on dialup. http://urbanlegends.about.com/od/business/a/cellphone_tips.htm – Some of you may have received an email flyer, as I did recently, containing all sorts of secret magical things your cell phone can do, including accessing hidden power reserves and unlocking your car door from far away with a spare remote key. It was a great read but, as the Urban Legends website shows, most of the claims were either bogus or only partially true. NZ's dirty search secrets: Google offers a lot of free tools, and one of my favourites is Google Trends. Among other things, the service can provide information on specific Google search terms by region, within a date range. Click here for more. Time to reform NZ's censorship laws? : Ministry of Justice and Internal Affairs officials have been meeting key stakeholders and industry and government body officials during the past fortnight to gather submissions for a "tightly targeted review" of the current laws. Click here for more. Net news likely to stay free in NZ: In this part of the world newspaper companies say the advertiser-funded model for news websites - such as APN News & Media's nzherald.co.nz and Fairfax's stuff.co.nz - is likely to remain. Click here for more. 'No evidence ACTA is needed' - InternetNZ: Internet New Zealand has strongly opposed the signing of the Anti-Counterfeiting Trade Agreement (ACTA) by New Zealand in a submission to the Ministry of Economic Development. Click here for more. Trade Me feedback warning after lawsuit: If an internet auction goes sour, think twice before posting abuse about the seller - legal experts say you could be sued for defamation. Click here for more. Online shopping hits all-time high in NZ: Online shopping has reached an all-time high in New Zealand, with over 1.4 million people making a purchase on the internet in the past 12 months, according to Nielsen. Click here for more. Internet not for all: Dial-up internet connections may be on the decline and there may be more cellphones in New Zealand than people, but technology in the home is still far from ubiquitous, according to a Statistics New Zealand survey. Click here for more. Facebook hacker claims to be in NZ: A Russian hacker who says he is living in New Zealand attempted to sell the login details of millions of Facebook users - an unprecedented attack on the world's biggest social networking site. Click here for more. YouTube turns five - NZ's top 10 vids: Click here for more. YouTube gets new look: The video-sharing site owned by Google has revamped the pages where visitors watch clips. It's an effort to de-clutter YouTube and drive people to watch more videos. Click here for more. The McDonald's 'Fakebook' page: The number of 'Fakebook' groups are on the rise - tricks fuelled by those impulse-clicking people who think if something looks too good to be true, well, it's still worth a try. Click here for more. Rumours round the world in twinkling of a tweet: Anna Paquin's bisexuality, Rachel Hunter's split from Jarret Stoll, Russell Crowe's bar-room brawl in London – ever wondered how everyone seemed to know before you? Click here for more. What your web browser says about you: If you've never thought about the web program you use, it's time to pay attention – because technology's biggest names are fighting for supremacy of your screen Click here for more. Facebook to scrap 'become a fan': Facebook is about to change the way it asks its users to connect to brands on the site. Instead of asking people to "become a fan" of companies such as Starbucks, Facebook will let them click on a button that indicates they "like" the brand. Click here for more. Young job-seekers hiding their Facebook pages: Many students and recent graduates say they are changing their names on Facebook or tightening privacy settings to hide photos and wall posts from potential employers. And with good reason. Click here for more. Twitter users not so social after all: Twitter may be a fast-growing social network, but most of its 50 million accounts merely follow other users rather than posting their own messages. Click here for more. Facebook slander mum hits back at son: The mother of a 16-year-old boy said she was only being a good mother when she locked him out of his Facebook account after reading he had driven home at 150km/h one night because he was mad at a girl. Click here for more. How youth are using the web: If you try to watch over the shoulder of most teenagers while they work online, chances are they'll tell you to push off. But young people today are using the web for many reasons, not just for wasting time. Click here for more. One in 10 teens cyberbullied every few weeks: One in 10 Australian teenagers experience cyberbullying, involving nasty messages or photos posted online or sent on mobile phones, every few weeks, according to new research. Click here for more. Photographers, artists sue Google over copyright: Groups representing photographers and artists yesterday accused internet search engine Google of copyright infringement in a lawsuit that mirrors complaints book publishers and authors have made for years about the company's attempt to create the world's largest digital library. Click here for more. Men switching off from web communities, says study: In a sharp reversal, more young women are now embracing online communities than their male counterparts, a new study says. Click here for more. Shadow cyber spy network revealed: A "complex cyber-espionage" network that penetrated various organisations including the Office of the Dalai Lama, has been uncovered by researchers. Click here for more. Google tweaks search results with mystery site speedometer: Google is now using site speed - "how quickly a site responds to web requests" - as part of the criteria for ranking links on its world-dominating search engine. Click here for more. Young adults care about online privacy too: All the dirty laundry younger people seem to air on social networks these days might lead older people to conclude that today's tech-savvy generation doesn't care about privacy. Click here for more. Rolling Stone's archive going online - for a price: For the first time Rolling Stone is inviting its readers on the long, strange trip though the magazine's 43-year archive, putting complete digital replicas online along with the latest edition. But you'll have to pay to see it all. Click here for more. Policing internet use raises tensions: You can find all sorts of interesting things on the internet. Such as the fact 30 to 40 per cent of internet use in the workplace is not related to business. Click here for more. Facebook opens door to cheating: Popular social networking website Facebook is being blamed for a growing number of divorces as bored and lovesick middle-aged couples hook up with their ex-lovers or childhood sweethearts. Click here for more. Students suffering from Internet addiction - study : Crackberry is no joke. American college students are hooked on cell phones, social media and the Internet and showing symptoms similar to drug and alcohol addictions, according to a new study. Click here for more. Cyber criminals change tactics: Mass indiscriminate computer attacks are giving way to highly targeted individual attempts in a new wave of professional cyber crime, experts say. Click here for more. Shortened links may not be as evil as first thought: Link-shortening services such as TinyURL seem ideal for criminals because they can disguise the names of malicious sites. Click here for more. Blackmailware publishes your web history, then wants your money: Some Cybercrooks are taking a slightly different approach to malware - hijacking PC users' web history and publishing it. Users are then forced to pay a fee for the potentially embarrassing information to be removed. Click here for more. Facebook unveils revamped online safety site: Facebook has launched a revamped internal site designed to help people stay safe and report threats while on the popular online hangout. Click here for more. Net ratings shelter kids: The responsibility of policing children's access to the internet can weigh heavily on the shoulders of parents. But, now, British internet provider Tibboh aims to relieve parents of some of that burden. Click here for more. Google Earth nabs boat dumper: A Florida Panhandle deputy was able to track down and arrest a man on charges of illegally dumping a boat near his home with a surprising tool: satellite pictures provided by Google Earth. Click here for more. British boy racks up $1,400 tab on Farmville: Fake crops on Farmville – the "free" social game that's become a huge hit on Facebook - cost a British mother some real cash after her 12-year-old son racked up $1,400 in charges on the game. Click here for more. Researcher analyses dreams through Twitter: Twitter users can send synopses of their dreams (in 140 characters or less, of course) to the Twitter handle @dreamshrink. Researcher Jennifer Parker, with the University of West England in Bristol, will choose 10 of the most interesting dreams and will parse out their meaning through the micro-blogging service by the end of this week. Click here for more. George Bush fears email privacy breach: US prez George Bush has admitted he does not send personal emails to daughters Jenna and Barbara for fear that his "personal stuff" might end up in the public domain. Click here for more. Congress confuses file sharing with manslaughter: Since involuntary manslaughter brings, on average, anywhere from 0 to 36 months' incarceration, one might well question the morality of going harder on those who trade files than on those who negligently cut short the lives of fellow citizens. Click here for more. Anti-spam laws bite spammer hard: The net's self-declared spam king is seeking bankruptcy protection. Click here for more. Florida Man Secured BenedictXVI.com Weeks Ago: By the time Cardinal Joseph atzinger of Germany assumed his new papal moniker on Tuesday, it was already too late for the Vatican to buy the corresponding dot-com Web address. Click here for more.